There are many reasons that I love being a Newborn Photographer. One of my favorite parts of this job is documenting these tiny infants turning into little people. When the babies come back to the studio to celebrate their first birthday it’s like meeting them for the first time. As newborns you only catch little glimpses of the kind of person they are going to be, but by their first birthdays, their little personalities have really begun to bloom. 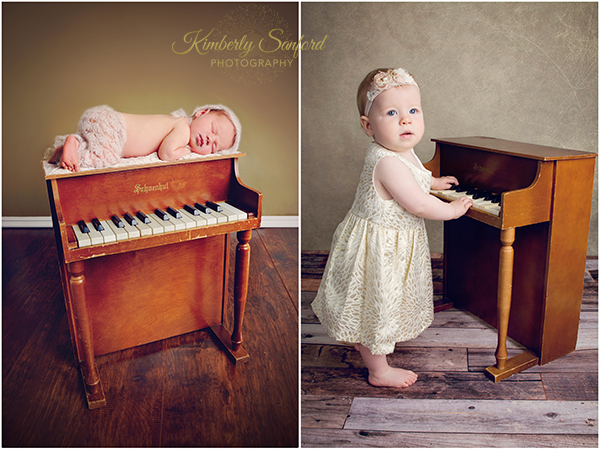 I remember a year ago when Petra’s Mom asked me to do a Newborn shot that included my new child’s piano, I had in mind that I would love to do another shot with this prop when she was big enough to play it; and here it is. I can’t believe that a whole year has gone bye, but it’s probably seemed even quicker for Petra’s family. Petra is perfect and lovely in every way. Very sweet and photogenic and she loved playing with her Mommy’s green beaded necklace. She often pointed her little toes like a dancer and her Daddy was especially good at making her smile! First Birthdays are a time for celebration! 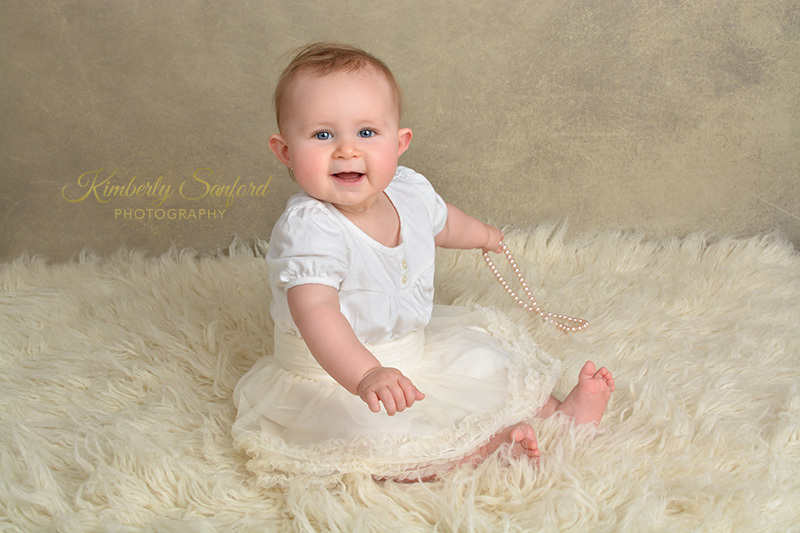 If you’d like to celebrate your child’s first birthday with Kimberly Sanford Photography, please contact me. I’d be happy to hear from you. As a Moms, we often feel a compulsion to capture every milestone and “first” that our child has. And in those first 12 months, there are so many of them! By the time our little one’s first Birthday comes around, it’s almost bittersweet. They change so much in the first year and it is truly a privilege as a Photographer to help document their growth and to watch them change.It seems like just yesterday that she was tiny enough to fit comfortably in her Father’s hands, yet it’s been a year since Betalee came to my old Photography Studio in East Rochester, and had her newborn photos taken. This weekend she came back with her parents to have One Year Photos taken to commemorate her first birthday. Betalee’s Mom brought in this adorable outfit with the purple tutu and bow. It just happened to match perfectly with my new purple backdrop from Intuition Backgrounds. While Betalee was getting dressed, her Mom and I were chatting about the Newborn session and she kindly reminded me of how Betalee took the liberty to relieve herself on me during the shoot. I laughed. It’s funny what parents remember. The truth is that happens to me so often that I lost count a long time ago. I consider it an occupational hazard! The little pink dress is one that I bought for the studio because I love the vintage look of it. The headband was one that I made a while ago and just happened to match perfectly! I paired it up with my real pearl necklace and changed the color of the flower in post-processing to match. Tada! Color-coordination Perfection! The last couple of photos turned out to be my favorite from the whole shoot. 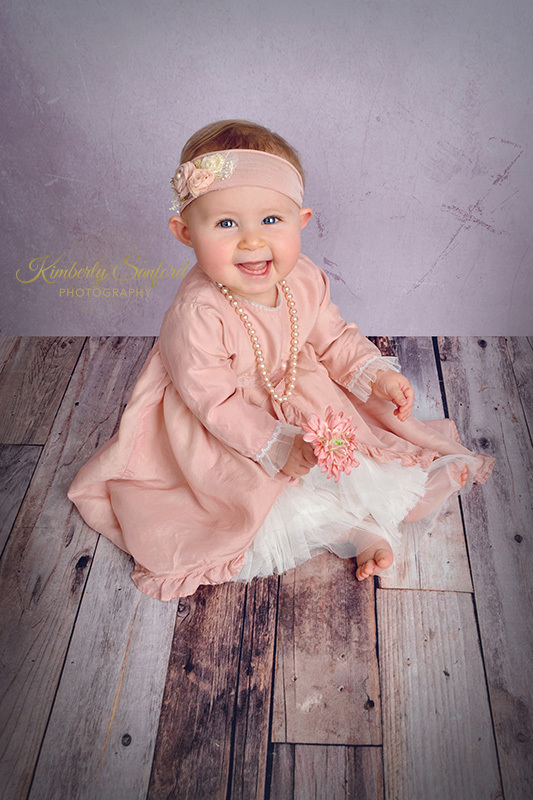 I love the simplicity of neutral colors and how they draw all of the attention to the beautiful baby and her stunning blue eyes. 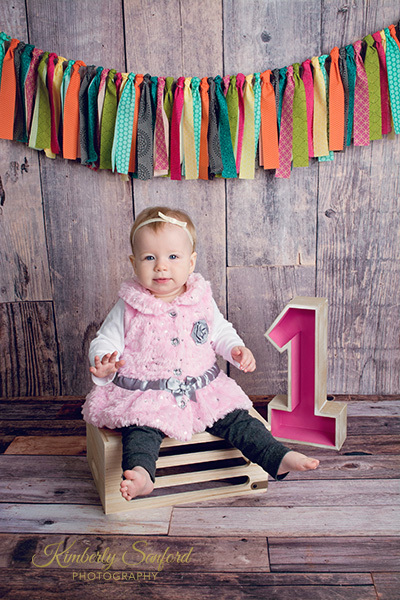 If you are interested in scheduling a photo shoot for your child’s first birthday, please Contact Me today! Spring is upon us in Rochester, NY (even if the weather may not always agree). It has been a pretty decent winter compared to most, but I’m looking forward to warmer days, outdoor portraits, and one of my favorite events of the year; the Lilac Festival in Highland Park. It has become a yearly tradition for my Mom and I to celebrate Mother’s Day at the Lilac Festival. We take our time looking through the artist and vendor booths and we always stop to take some portraits of the kids in front of the rows of tulips. My kids especially enjoy the frozen bananas on a stick (Just don’t forget the wet wipes if you’re going to try this delicious treat!) and stopping to play at the playground. There is a reason that Highland Park has long been a favorite portrait location for local photographers for generations. It is picture perfect this time of year. Even my mother and father had their wedding photos taken there more than 30 years ago. Maybe it’s just wishful thinking but I can almost smell those lilacs now! What are some ways that you celebrate Mother’s Day? Will this year be your first? 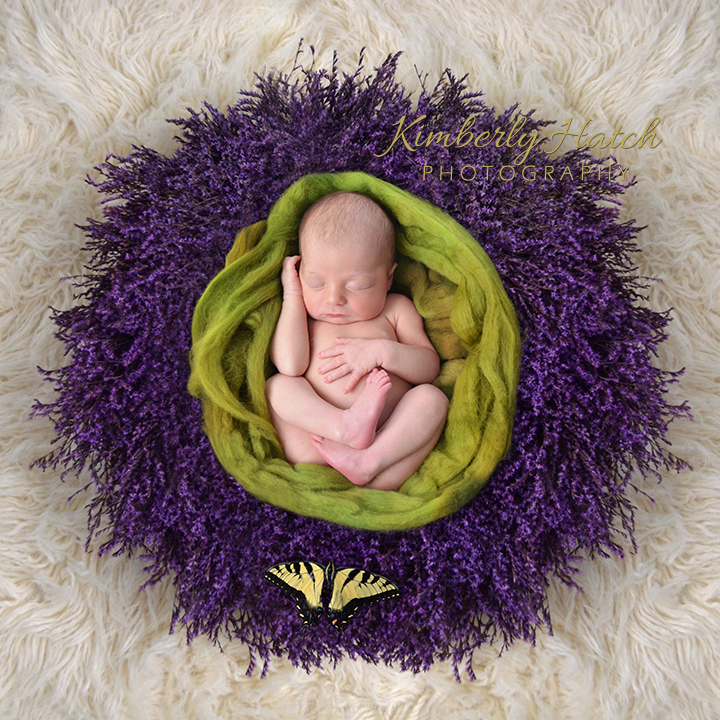 In honor of Spring, Mother’s Day, and the Lilac Festival, I’d like to give one Mama a complimentary Lilac Themed Newborn Session at my studio in East Rochester (a $150 gift). 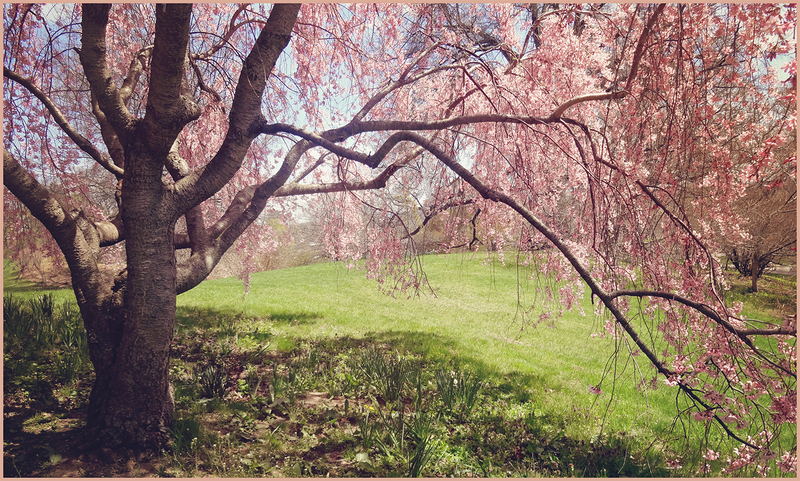 This Lilac Festival Spring Giveaway is open to women due with a girl in the last week of April. Send me your name, due date, and your favorite way to celebrate Spring. I will randomly select a participant from those that contact me. The winner will receive a full 2-3 hour studio session in exchange for allowing me to use the images for marketing. Prints and products can be purchased at an ordering appointment 2 weeks after the session, but no purchase is required. Photo shoot must take place when the infant is less than 14 days old. Ready to enter? Contact me here. As a new Mom we learn so many new things every day. This list of 10 Things Every New Mom Should Know will help you along your journey. I wish that someone had told me some of these things when I had my first baby 9 years ago. As a Photographer this lesson was a really tough one for me to learn. My first instinct is always to take a photograph in order to capture a memory. While Photographs are amazing for documenting those little changes, there is something completely priceless about taking little videos of your baby too. That way you’ll be able to hear their little coos and watch the facial expressions when they are much bigger. Someday they will really enjoy watching those videos with you too. By the time you give birth you will probably be up to your ears in everyone’s advice. Complete strangers have probably already accosted you in the grocery store telling you about their pregnancies and what you should expect and do. Politely put in the invisible ear plugs. Ultimately you need to do what’s right for you and what works best for your family. Every mother has it. With this new super power you will be able to know when something is not right; you just have to trust yourself. As a new Mom you won’t always want everyone and their Grandmother touching your baby. Those instinctual hormones will kick in and there may be people that you just won’t want touching or holding your kid. It is perfectly OK for you to say no if it’s making you uncomfortable. Don’t be afraid of offending that person. Things will never go back to the way they were before baby was born; but life just got richer and more full. Take time to find your new normal. Do you love drinking Starbucks or having your nails done? Whatever you love to do that makes you feel like a pampered princess, make time for it. Even if it’s just taking an extra long shower in the morning. It’s easier to take care of everyone else when you are taken care of first. Don’t neglect yourself. There are so many groups of Moms out there that can offer advice or playdates as your baby gets older. Search for a local group in your area and join up to make some lasting friendships. If you’re stumped, Facebook is a great place to start. 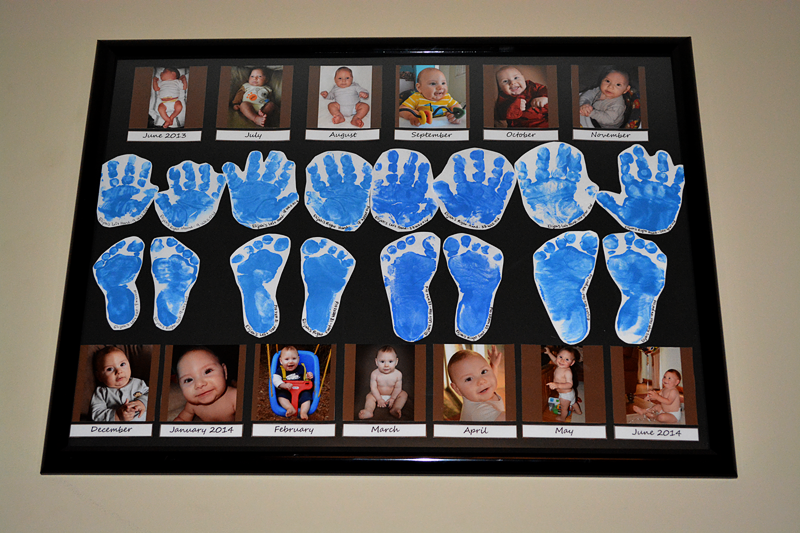 Art projects may seem a little daunting right now, but find a fun way to show how baby is growing in their first year. Some people take photos in the same place each month with a little sign, some go to a professional photographer, or you could try your own Baby’s First Year Collage. If the house doesn’t get clean today or the dishes don’t get done, try not to be too hard on yourself. You just spent the last 10 months growing a human being in your belly and now everything is different. Savor your baby and don’t feel guilty if everything doesn’t get done. It may seem scary at first because everything is new and unpredictable, but pretty soon you will become a seasoned veteran at taking that baby out of the house. Again, go at a pace that you are comfortable with and if you need to leave somewhere because it’s too overwhelming; then do what is best for you and the baby. Would you like to know how a Photographer and Mom lost 80 pounds in 8 months? My name is Kimberly and I’m a Newborn Photographer in East Rochester, NY. I’m also a single Mom with three small children. This is the story of how I found a formula that works perfectly for me and has allowed me to lose 80 pounds in 8 months and to maintain my dream weight. 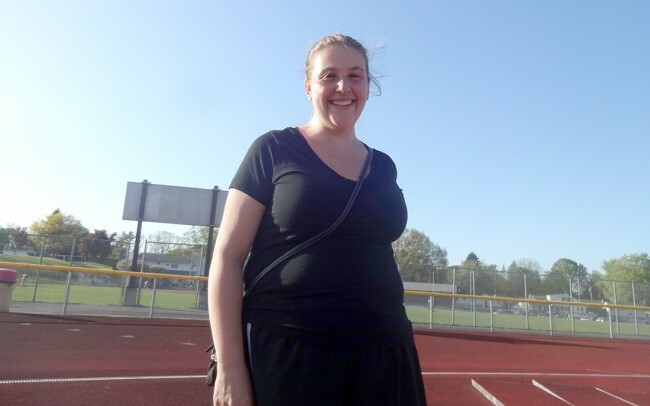 I didn’t just lose my pregnancy weight, in fact, I didn’t even factor that in (I was 278 pounds when I was pregnant with my third)! I’m going to share with you how I blew my pre-pregnancy weight out of the water and finally achieved the body I’ve wanted my whole life. 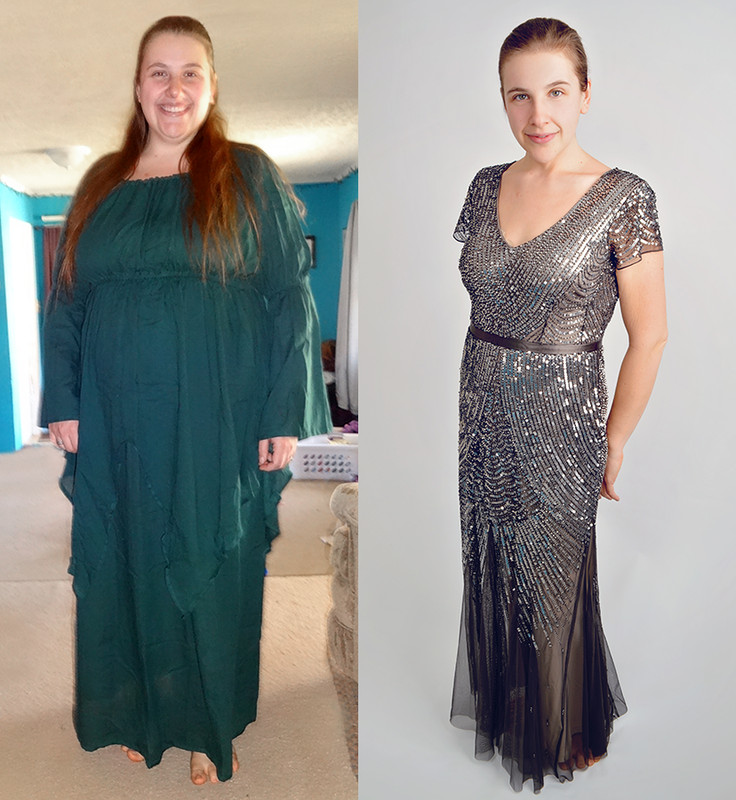 Before and after losing 80 pounds in 8 months. When I first started, I wasn’t even trying to lose weight. In the fall of 2014 I went to one hooping class and bought my first hula-hoop. It’s probably safe to say that I was the worst hooper that ever existed. I would give the hoop a push, it would spin once (if I was lucky) then fall down. There was definitely more bending than hooping going on. But I didn’t give up. The teacher had said that it takes 100 revolutions to strengthen the muscles needed to keep the hoop up. Throughout the winter I kept trying with very little improvement. It wasn’t until Spring of 2015 that I picked up the hoop and began trying every single day. Little by little I was able to keep the hoop up for longer periods of time. The confidence that I gained from persevering through the discouragement was what propelled me into a weight loss journey. I thought, “If I can be good at this, then I can do anything. 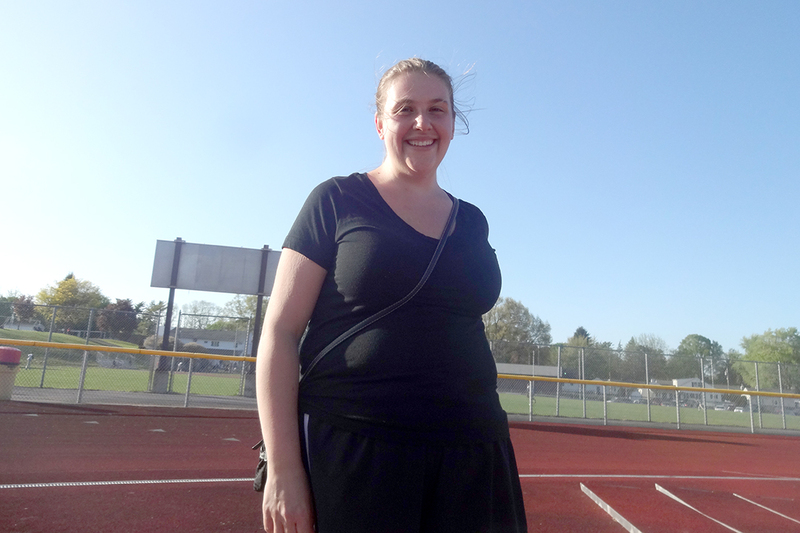 I began taking my kids with me to the outdoor track 2-3 times a week. They played in the “sand box” (long jump pit) while I ran a mile each time. At this point I hadn’t done anything to change my eating habits but I was inspired to begin making small changes there too. We had already made the switch to Gluten-Free when my daughter was diagnosed with Celiac Disease. I started to very slowly eliminate foods from my diet and replace them with healthy raw and whole foods. The first thing that I cut out was carbs (breads and pastas, not fruits). I allowed myself to eat as many fresh fruits and vegetables as I wanted. Almonds and avocados became a staple in my diet. Without carbs, I had no more cravings for sweet things. If I chose to sweeten something I used raw honey or pure maple syrup. Going to the track was working well for me. I had a good routine and the kids were having fun. I began running 2 miles every time I went. Then one day as I was walking the kids to school I saw caution tape blocking the entrance to the track. When I asked the crossing guard about it he informed me that the track would be closed for the entire summer while they tore it up and replaced the track and field. I almost felt like giving up, but I had come so far. I needed to find a new routine. Something that would fit into my life as a single mother with 3 small kids. Going to the gym sounded appealing, but wasn’t a possibility. So I found a used treadmill on Craigslist and put it right in my living room. My diet continued to evolve. The next thing to go was dairy. Originally I gave it up to try and help with seasonal allergies. I never thought I’d be able to give up cheese for good, but pretty soon those cravings stopped too and I just kept going. The final change was the switch to a vegan diet. I stopped eating all meats and eggs. I’m not 100% strict and I’ll occasionally eat wild-caught Cod or Salmon. I was in a great place with my diet and I had a steady workout routine. Monday, Wednesday, and Friday mornings I ran 2 miles on the treadmill (alternating every quarter mile between 5 and 6.5 mph) then hula-hooped for 800 revolutions. Sundays I ran 3.1 miles. In October of 2015 I ran my first 5K race and I came in under 30 minutes! In November I finally reached my dream weight of 155 pounds. 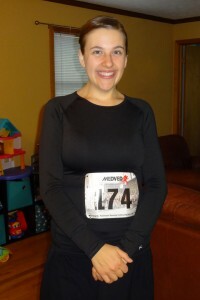 Ready to run my first 5K race! Not only did I lose 80 pounds in 8 months, but I’ve been able to maintain that weight loss steadily. I’ve added arms with a resistance band and a standing ab workout to my routine, but nothing else has changed. When I was running the track where I used to do cheerleading as a young girl, I imagined my younger self cheering me on. I used to hate running more than anything. I knew that if younger me could see grown-up me I would have been so proud because I was finally doing it. When I was younger there was nothing I wanted more than being thin. Now I’m living the dream, and it’s a very good one. After that I spent many hours researching WordPress and web design. I watched many youtube videos and conducted countless Google searches. It was definitely a learn-as-you-go process. My first attempt was good, but I knew that I could do better. My first attempt at designing my own website. 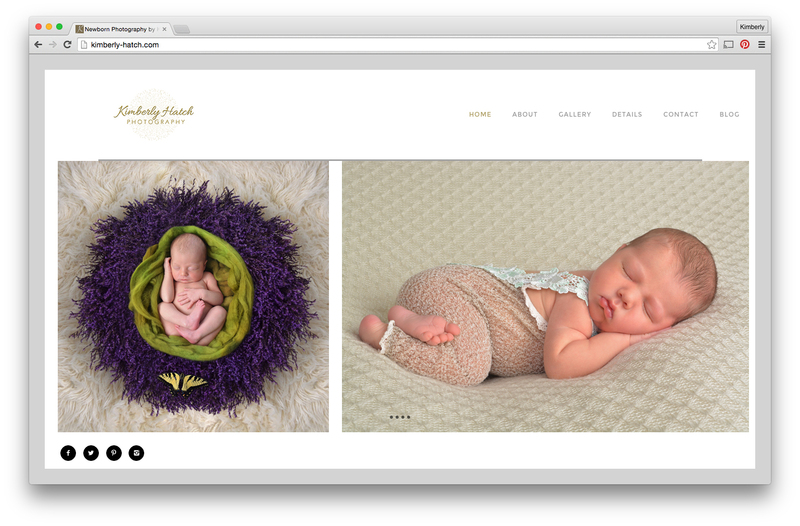 One year later I began researching themes that were popular for photography websites. I came across one that I fell in love with and I felt it beautifully represented my brand. If I had to use three words to describe what I want my brand to represent they would be: Elegant, Classy, and Beautiful. I hope that when you browse through my new site that at least one of these words comes to mind. Please leave a comment and let me know what you think about the new design. Is there something that you have been wanting to do but fear of failure has been holding you back? My advice to you is jump right in and don’t take no for an answer. It may take a long time, but the success is that much sweeter when the road has been hard. Stay tuned for another post later this week where I will explain how I used the same determination and stick-to-itiveness to lose 80 pounds in 8 months. You truly can achieve anything if you stick to it. 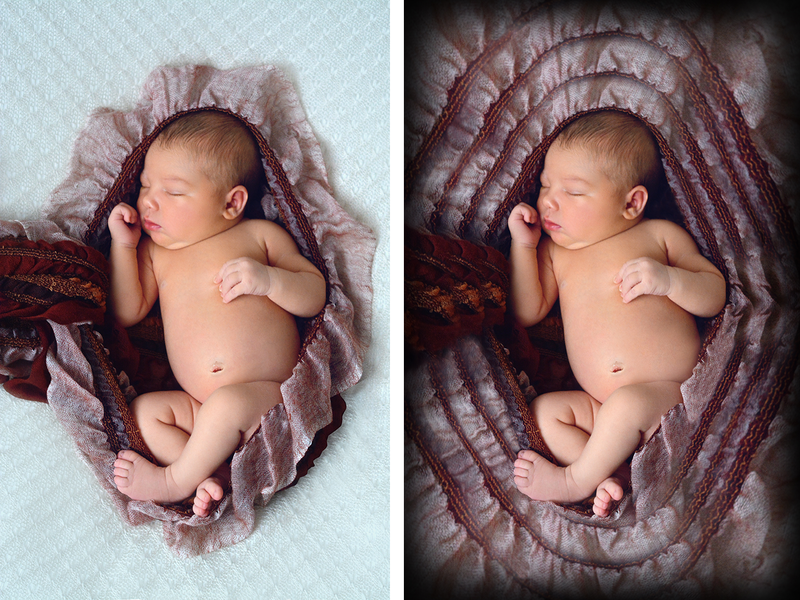 After a recent Newborn Session I began to play with one of the images. I loved the original but I also felt that there was more to be said. To me, the final image on the right conveys the warmth and security of a baby inside of their Mother’s womb. The rings are like the echo of a Mother’s heartbeat. When I showed this image to my own mother she said it reminded her of the rings of a tree that mark its age. That’s part of the beauty about creating Newborn Art. Ultimately, people will see what they want to see based on their own experiences, perspective and reality. What do you see when you look at the image on the right? I’d love to hear your comments and feedback. Sometimes capturing a beautiful photograph in the camera is only the first step in bringing a vision to life. As photographers in a digital era we aren’t limited to capturing the world around us, we also have the power to create a world of our own. My daughter has always loved fairies and rainbows. To her the world shown on the right is her every day reality. When she saw what I had done to this picture, her face lit up with joy because she realized that I understood her! With editing software anything is possible; dreams can become a reality and an artist’s vision can light up the page in new and exciting ways. 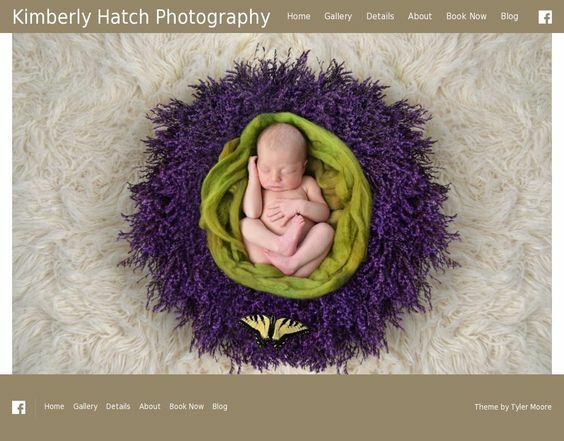 If you would like to experience the magic of a Newborn photoshoot with Kimberly Hatch Photography visit the contact page. Let’s take Newborn Portraiture to the next level. My new business cards from MOO. 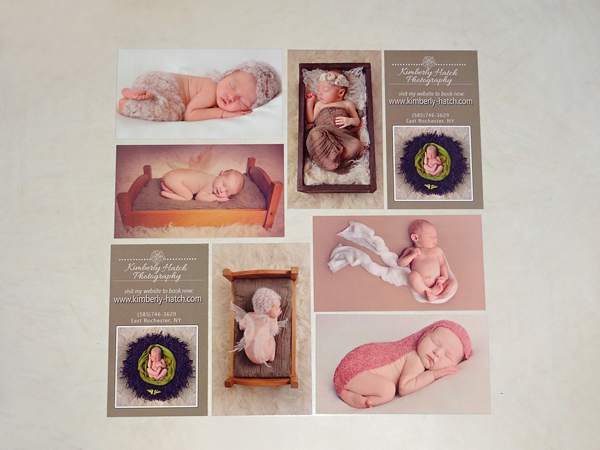 I recently received my new business cards from MOO.com and I am so impressed with them! They are like a little mini portfolio that I can carry with me. They even came in a nice black box that protects them from the 501 other things that permanently reside inside the unknown abyss that is “My Purse.” I’m proud to hand these to expectant mothers and I feel like they beautifully represent what I do. What is the Newborn Photography Investment? A lot of photographers that I’ve come across don’t have a page for pricing on their websites. Instead, you can find that information under a tab that says, investments. That got me thinking, “Is photography really an investment?” Let’s take a look at the definition of investment: the action or process of investing money for profit or material result. Well, we all know that images of your children aren’t going to make you rich. So how did the word investment somehow becoming linked to photography? Photographs are something that appreciate in value over time. The older your children become, the more fondly you will look back upon the times when they were tiny and completely dependent on you for their every need. Those moments that you treasure now will someday be hard to recall. You think that when your child is 20 that you will still remember how tiny their little hands were the day that they were born, but the truth is that memories fade as they are replaced with newer ones. That is why Newborn Photography is truly an investment that increases in value for your family over time. So in 20 years, how much will images of your newborn baby be worth to you? Can you put a price on a captured memory? The Newborn Photography Investment is a price that you pay today in order to receive a sliver of time immortalized in a beautiful piece of timeless art. And that little baby that is so precious and tiny now, will someday be grown and living on their own, while the images that you bought so long ago will have become priceless to you. Ready to make the investment? Contact me today. I’m sure as a new parent that you’ve probably heard about a million times already that kids grow so fast. Every well-meaning stranger feels it is their personal duty to tell you that you’d better enjoy them while they are small, because before you know it, they are in college and you’ve got an empty nest! When I had my first child I knew I wanted to do something special to capture her first year and to show how much she grew in that short amount of time. That’s when I came up with this idea. At 9 weeks, 18 wks, 33 wks, and 1 yr baby and I had a little fun with some acrylic paint. I suppose they have different (and less messy) mediums out there that could be used…but it was all that I had at the time. I made sure each time I did the handprints and footprints, that I made as many as I could and I gave out the extras to the Grandparents as gifts. I’ve since done this project with all three of my children. I remember when I was pregnant with my second I was so excited that I was able to do this again. The image above is from my third child’s collage. They proudly hang on the wall in my living room. Every time I look at them I can remember not only how little they were when they were small, but also how strong and quickly they grew. I truly treasure these captured memories.